Egyptian President Hosni Mubarak has confirmed that he will stand in the presidential election on 7 September. It will be the first time the presidential poll has been open to more than one candidate. Mr Mubarak also invited Arab leaders to attend a summit in the Red Sea resort of Sharm al-Sheikh on 3 August. He said there were worrying developments in the Arab world, including the situation in Iraq and with the Palestinians. Mr Mubarak said a shared Arab position on these needed to be developed. Correspondents said the venue for the summit was apparently chosen to try to show government resolve following the bombings in Sharm al-Sheikh last week which killed 88 people. The Egyptian government says multi-candidate election will bring greater democracy to Egypt. Opposition groups say it is designed to improve Egypt's image internationally without bringing about real change. A growing number of opposition leaders have said they will boycott the election. 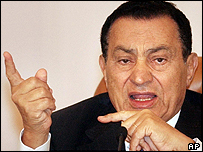 Mr Mubarak, who has led Egypt since 1981, is seeking a fifth term as president. "I will seek to win the trust and support of the people for a new term," Mr Mubarak told a gathering of supporters in the Shibin al-Kom, the capital of the northern province of Menoufiya, in which he was born. "I have embarked on a journey on which I will not falter before I complete it." He proposed replacing the country's emergency laws, which have been in place since the assassination by Islamic militants of Anwar Sadat in 1981, with new legislation to "combat terrorism". "There is a need for a firm and decisive law that eliminates terrorism and uproots its threats. A law that protects national security and ensures stability." Opposition groups say the authorities have used the emergency laws to curb political freedoms, and have focused their campaigns on repeal of these laws and on the fact that Mr Mubarak has ruled Egypt for just short of a quarter of a century and is seeking another six years.